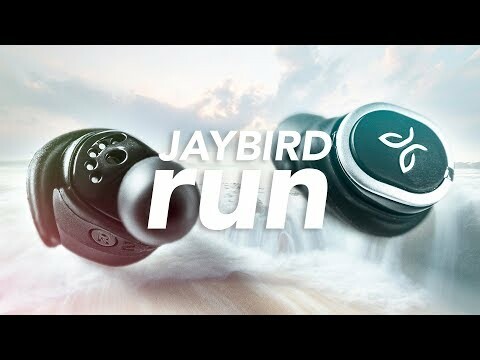 If you can deal with a somewhat jittery connection, the Jaybird Run truly wireless 'buds have a great fit, decent sound, and good battery life. Jaybird has been one of the leaders in Bluetooth headphones for years now, and after Logitech bought them last year for a crazy amount of money I only expected better things to come from the team there (I mean after all their keyboards and mice are killer). Today they announced their first pair of truly wireless earbuds. Jaybird is hoping to hold their own with the likes of Bragi, Jabra, and Apple. These headphones are simply named “Run”, because that’s what they’re made for – running. Luckily the good folks over at Jaybird let me hold on to a pair for a few weeks so I can test them out. In the box you’ll get a charging case with the headphones inside, the accessory pouch with a 6” micro USB charging cable and some extra sets of ear tips and wings so you can get the perfect fit, the Jaybird sticker, the instruction booklet and warranty information. There seems to be a standard design that all truly wireless earbuds share, save for Apple’s Airpods which I still can’t get to stay in my ears. These don’t have that problem as the oval-ish design sits nicely in my ears and the wing tips give it that extra level of comfort and security. In all the time I wore these I never once had them fall out which is exactly what you want while exercising. Now the way these stay in your ears is the same method employed by most truly wireless ‘buds, which is to say that they wedge themselves in your ear like they’re afraid to fall out. You just have to slip them in your ears, give them a little twist so they lock into place, and then you’re good to go. It isn’t as uncomfortable as it sounds at first, but after about an hour and a half you might need to take them out for a second to let your ears breathe. It’s not painful just a little uncomfortable. Still, my runs usually last at most half an hour, and by the end of it the slight pressure in my ears is the last thing I’m worried about. If you do have trouble getting them to fit you can always try a few different combinations of tips until you get the right one. The ‘buds themselves are mostly made of a black plastic, but they do silver accents around the rim and on the logo which is made of stainless steel and it’s not there just for looks, it’s actually the antennae. In order to get a better Bluetooth signal they actually wrapped the antennae around the exterior of the ‘bud which is a clever workaround to bad signal issues. That said, this didn’t solve all their connection issues unfortunately. The logo on either ‘bud also acts as the only two buttons on the headset which give you a certain amount of control over playback. Now as far as sweat-proofing goes these don’t officially have an IPX rating, but they do have a double hydrophobic coating to prevent sweat from eating away at them. Now how these hold up over extended use only time will tell, but so far I haven’t any issues with sweat. Then there’s the charging case, which out of all the true earbuds I’ve tested is one of my favorites. Second only to the Apple Airpods case only because those are smaller, but not by much. This charging case looks like an over-sized pill or a really small Beats Pill speaker. It has three tiny LED lights on the front to let you know how the battery is on the case and both the left and right earbuds, but it also has some clever tricks about it that make connecting to them seamless. As soon as you open the case for the first time the headphones enter pairing mode, and every time after that all you have to do to connect is open the case. It’s amazing. I’m used to putting the headphones on and then cycling through Bluetooth settings trying to connect before starting my workout, but the Jaybird Run’s take care of that for me. To re-pair with another device all you have to do is hold down the button on the right earbud for 6 seconds, but if you’re only going to be using these with one device then just opening up the case and automatically being connected is pretty damn awesome. But it’s not all rainbows and butterflies. Even with the clever external antennae Jaybird still couldn’t find a way to get rid of drops and skips entirely. Whether the phone was right next to me or twenty feet away, in my left pocket or my right one, in the middle of an open gym or in my apartment with a few walls away, the result was the same. These are just inconsistent. I eventually stopped trying to figure out the source of the issues and just ended up accepting my fate along with the random split second drops that happened every few songs. As far as playback controls go these are also fairly limited, but they do get the basics done. You can use the app to switch between the default controls which makes the left bud access Siri and the right one play/pause music and answer phone calls, or alternative controls which makes the left bud volume down and the right bud volume up/phone calls. Whichever setting you choose you can still double tap to skip to the next song but there’s no going back to a previous track. Though I did find that the buttons were kind of stiff and not really easy to click. I end up stuffing the earbud deeper into my ear every time I want to pause the music. And a double click is twice as annoying. The Jaybird app gives you some added features that really make it an integral part of the experience. They have presets for different sound signatures and you can also customize your own EQ settings and save them if you feel like it. I kept them on the default setting (flat) because I’m lazy. It also lets you find your earbuds in case you lose one which is super useful with something this small. You can get the app for free on both the App Store and the Google Play Store. Jaybird claims a battery life of 4 hours of constant playback and we got pretty close. On max volume we were able to squeeze out 3 hours and 45 minutes which is pretty good. The charging case also gives you an extra two charges should you need them, but what really steals the show here is how quickly they charge up from zero. Just 5 minutes will give you a solid hour which, like I mentioned earlier, is enough for two of my longest runs. Sound quality on Bluetooth earbuds has never been amazing, and at best true wireless earbuds have had good sound. These are pretty much more of the same but with the added perk of being able to EQ the sound yourself. At first listen you definitely notice that there isn’t the same amount of detail here as with wired ‘buds, but the presets actually do a good job at making you forget that. If you A-B test them to your favorite pair of wired in-ears the difference is pretty obvious, but use them for a few days while exercising and these are more than fine. The low end is pretty strong even on the flat profile that I tested these on. The bass in the song “Luxury” by Jon Bellion still hits hard it just doesn’t have the same kind of depth I’m used to, and that only gets exasperated if you click the “Bring the Bass” preset. Rather than add extra emphasis to the low frequencies doing this just makes the bass feel like it’s getting louder which can mess with the vocals and other instrumentation. Hence why I chose to keep it on “flat”. Sidenote: this setting obviously doesn’t make it entirely flat but it does a decent job at faking it, and I mean that in a good way. As someone who likes a flatter sound I found these easy to enjoy. Mids also sounded like they weren’t given enough of a push, which I also really liked. The vocals in the song “You and I” by Toro y Moi flirt with the background synths throughout which I found to really add to the emotion of the song. If you prefer the vocals to be on top of the production you can of course just tweak the EQ settings. It’s a bit limiting but if you know what you’re doing you should be able to get pretty close to a sound you enjoy. My biggest problem with these lies with the highs. I enjoy a nice airiness to my music where I can hear a cymbal hit float around my head if I close my eyes, and that isn’t the case here. These definitely concern themselves with limiting the highs to a certain point so as not to become piercing, but they don’t do much in terms of detail. When it comes down to it I was simultaneously impressed and unimpressed with the Jaybird Run. The build quality and discreet charging case definitely caught my attention, but it lines up with what I’d expect from a product that costs $179. Plus the quick charging feature is super useful and because the entire package is so small, keeping them in my pocket while walking to the gym was enough to charge them up enough for a full workout. The sound quality was also better than most truly wireless ‘buds I’ve tested purely because of how much the app lets you customize the sound. You’re not going to get audiophile quality but these are by no means a crappy pair of Bluetooth ‘buds. The sound is more than capable of letting you enjoy your music while also keeping you energized throughout your workout. The playback controls were kind of limiting and clicking the button on the earbuds was borderline painful, but I can live with both. What I can’t live with is the audio skipping that occurs randomly. It really takes you out of the workout when it happens and while it doesn’t happen constantly, it happens often enough. I wouldn’t call it a dealbreaker, but it’s definitely not a deal-maker. Are these the ‘buds to take down the Apple Airpods? Probably not. But that doesn’t mean you shouldn’t give them a shot. Jaybird doesn’t disappoint with another solid product, and this time there really are no wires.